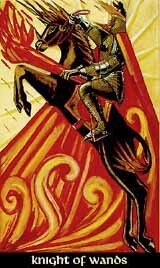 Being fire in fire, the Knight of Wands is the purest manifestation of his element - burning, flaming, enthusiastic and thrilling. He is the born leader, full of ideas and idealism, proud and commanding, at his best noble, honest, conscientous and intelligent. For Atziluth is the highest of the worlds and Fire the highest of the elements, the Knight of Wands can stand for highest inspirations, spiritual realisation and purest creativity. But with fire in fire, the Knight of the Wands lacks the depths of waters, the stability of earth and the analyzing logic of air. His strength might degenerate to pure tyranny, his convictions stiffen to dogmatism, he might get cruel, bigot and brutal at his worst. Further the fires within fire lack the sources of reserved potentials, so once the explosion is over, there is nothing more left for the Knight to provide.